Few Canadians realize that we have our own forest region of Amazonian proportions stretching across 60 per cent of the country: the boreal forest. 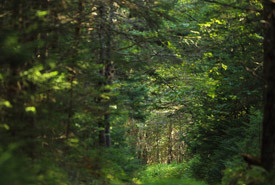 In fact, Canada’s boreal forests are some of the largest and most intact forests left on Earth. Coniferous and deciduous trees such as aspen, spruce and pine make up the boreal, which provides habitat for countless species, including woodland caribou and Tennessee warbler. Now, conservationists across the country are working together to protect what is left of it. The boreal forest region is one of the world’s largest biogeoclimatic zones. Encircling the North Pole, it shares a similar climate, geography and biodiversity. 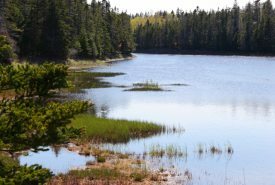 It is in fact Canada's largest ecosystem, stretching across all provinces except New Brunswick, PEI and Nova Scotia. 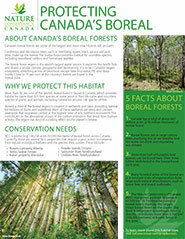 Close to 75 per cent of the country’s forests are found in the boreal zone. Almost a third of the region is covered in wetlands and lakes, providing habitat for more than 26 million ducks and waterfowl. Most of these wetlands are deep and ancient peatlands that sequester carbon at the highest rates of any northern ecosystems. This contributes to the absorption of part of the carbon emissions resulting from human activity. The region has kind of a cooling effect on the planet’s climate. What trees are found here? What is NCC doing to help protect this habitat? The Maymont 5 property in Saskatchewan in 2012. The Kurian property in Manitoba in 2013. The Busenius property in Alberta and the Powder Islands in Ontario, in 2014. The Crabbes River property and Salmonier River in Newfoundland. The Nebo property in Saskatchewan in 2016.